I interrupt this Narcey update to share how we are surviving the Midwest weather. . .
'Oh the weather outside is frightful' - well, that's an understatement. Thanks to crazy 50-something below windchill temps, school has been cancelled today (Jan 30th) and tomorrow. It's like a weekend just sprouted right in the middle of the week - a week that didn't feel like much of a week to begin with because we already had a snow day on Monday. 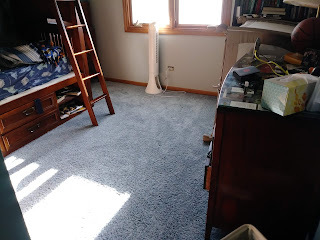 Rare to see the floor in Tank and Reg's room! Really this is better than a weekend, because there is NOTHING to drive to. No practices. No games. No religious ed. NOTHING!!! I am not babysitting, so I have the day off, too. My 5 living-at-home kids are home. Translation: I get just as excited about a day off as they do. Bring the snow days! 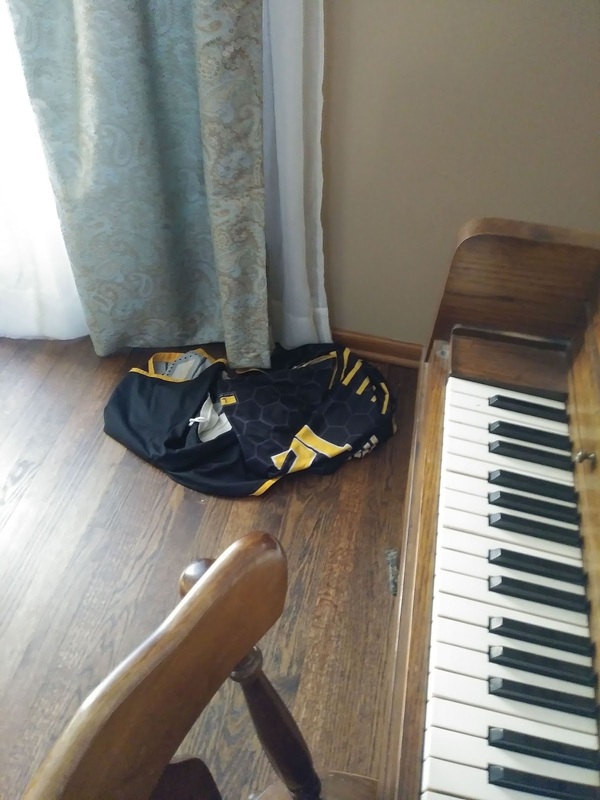 is what it is like to live with Tank! 3. his idea of making a lunch for school is to shove a few granola bars and a fruit cup and a rice krispie treat in a plastic bag. He will only bring a sandwich if I make it. He requires way more nutrition than this, and he has basketball practice right after school. It infuriates me. So, he has NO time to whip up pancakes in the morning. He recently learned to make mac and cheese. This is dangerous. He decided to make some on Monday (snow day), but he only made one box. Ate it all himself, never asked anyone else if they wanted any in advance so he didn't have enough for them. RUDE! Anyway, I read my book for awhile. I am not enjoying it. I will explain that in a later post. Then I remembered why I work out every morning BEFORE I do anything else. It was hard to get motivated to workout after being cozy on the couch with a (horrible) book. 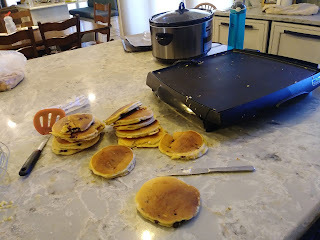 I agreed to make pancakes for lunch, but I told the kids that the only offspring who would get to eat the pancakes were those that accomplished something off of the list that I made. The job list was easy. Vacuum the family room. Clean a bathroom sink. Wipe out the microwave. Dust mop under the dining room table. Those were the jobs for the 4 contributing members of the family. Tank, the leave-a-trail-kid: PUT AWAY EVERYTHING THAT BELONGED TO HIM IN THE HOUSE. was plowed and spent $525. He was frustrated that he couldn't eat when everyone else was eating. He also asked me not to use 'that voice'. Oh, yeah - there is definitely a voice. I tried to help him understand that the voice happens when I have told him a hundred times to put his stuff away and he doesn't. Imagine how much sooner he could have eaten pancakes if he had gradually put stuff away each day? Unfortunately the smell of pancake batter sizzling on the griddle most likely interfered with his ability to grasp this concept. If only I had time to employ the 'sing for your supper' mentality on a regular basis. 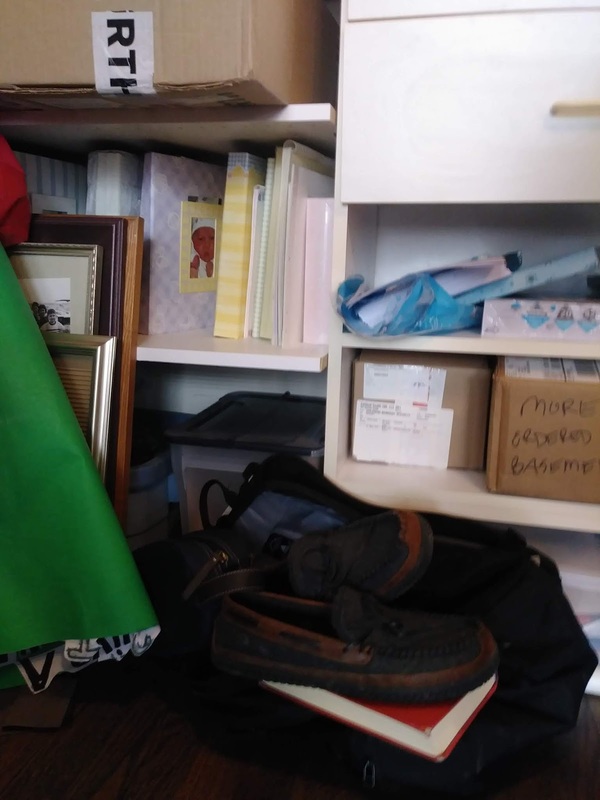 See his pile of stuff on the closet floor? 1/31/19 afternoon UPDATE: I just opened the closet in the study. There I discovered the stuff that Tank had gathered up from the first floor in order to ingest pancakes. It is hard to see in the picture, but it is a red book, his slippers, a backpack, and a travel shower kit bag. What in the world? He ended up getting sick last night around 8:00 pm. Puked about 25 times into the wee hours of the morning. Of course he is unable to show any self restraint. He admitted to chugging a bottle of water mid-puking. He knows NOT to do that. Sigh!